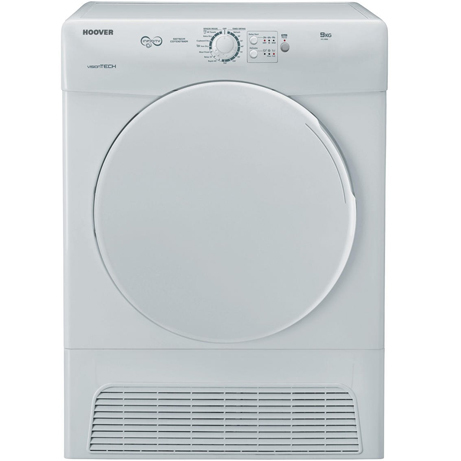 This Hoover Condenser Dryer is perfect for larger households with a drum capacity of 9kg. Being a condenser means that it does not require external venting, and therefore can be placed almost anywhere in your home. Boasting 4 sensor drying programmes, you can set the machine to how dry you would like your clothes and once the machine has dried to the required level it will automatically turn off. Vision tech dryers range is a synonymous of impeccable drying results for any kind of fabrics and an affordable ally to take care of all your garments. The dryer measures the amount of laundry loaded and its moisture content and adapts the cycle automatically, giving optimal, efficient drying for loads of all kinds. Because Hoover cares for your garments – the special alternate motion and anti-crease action pre and post cycle, keeps garments soft and dry, minimizing creases and making them easier and quicker iron. All Hoover tumble dryers come with inbuilt sensors which will measure the moisture content of the load and will stop the cycle when the load is dry. Which prevents the machine wasting energy by continuing to dry clothes unnecessarily. Condenser dryer machines separate water from the moist air inside the dryer into a container that needs to be emptied after drying. If you are not able to fit an external vent or not sited near a window then condenser dryers are more flexible.